Few restaurant experiences have left a profound influence on my way of thinking about gastronomy as Fulvio Pierangelini’s Gambero Rosso. This Italian chef who was riding the crest of the wave in terms of fame and success decided to close his restaurant in 2008 and since then has never returned back. Pierangelini, who had never taken a plane in the previous 30 years, as he himself says, has been away on a pilgrimage for the past six years. 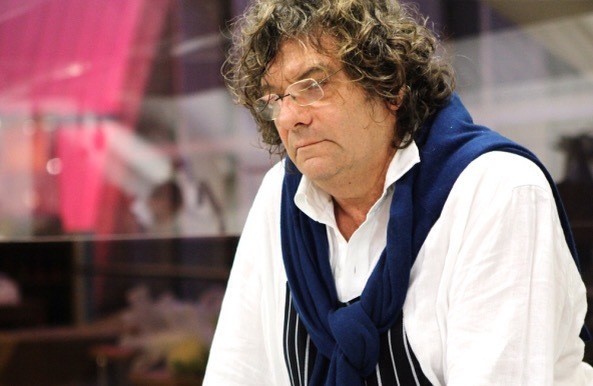 Pierangelini, an Italian, is probably one of the most enigmatic, underrated and captivating chefs of our time. He is maybe enigmatic because he hates the limelight, hates the internet with a passion and didn’t even know that restaurant guides existed when he opened his restaurant in 1980 in a small fishing village in Tuscany which as he himselfs says was in the middle of nowhere. You will wonder why an evening at Gambero Rosso had such a deep meaning for me. First, when we visited in 2006, this was the first 2 Michelin star experience for my wife and I, second the food in its simplicity was so profound. The explosion of taste and flavours was nothing like we had ever experienced before. Third, and this is probably the main reason, I had vouched to eat whatever was served at this restaurant despite the fact that I had a phobia of cheese. Alas, I still remember a cannelloni of suckling pig being served with Parmesan grated on top. At first, I started to sweat but once I got over it, and it took some time, I had the first bite and unbelievably asked myself “what was the fuss all about?”. But less about what I think and more about what this great chef thinks and in particular how he grew tired of restaurants and the dining scene, what he misses about cooking and what he dreams to do once he returns back from his ‘exile’ which if one is to go by what he says in the video below may be sooner rather than later. Pierangelini was speaking at the Mad Symposium which is organised annually by Noma’s Rene Redzepi in Copenhagen. Here, the Italian chef replies to a letter Redzepi sent him which asked him some profound questions on why he quit cooking and what will happen next. Pierangelini is not someone who likes the limelight. He actually hates promoting himself to the extent that he did not have any public relations, website or email address despite his success. He called on the audience made up of young chefs to have the courage to be imperfect. “Don’t ever forget that simplicity is the ultimate goal. Always remember that a cook is someone who executes. Many chefs today think of themselves as composers. To this I would say that the world needs a perfect schnitzel much more than an improbable dish of dover sole with chocolate,” he said to applause. Why I opened Gambero Rosso? Pierangelini, as someone who hates publicity also hated the internet. “I had to say no to many things. I took radical positions against the fake democracy of the internet even though I was loved and praised by everyone. I reached the limit when I said that food blogs are to gastronomy what pedophiles are to love,” he said with a smile. “But our job is something different. it cannot be quantified. How much does passion, sacrifice, independence cost? Suffering, emotion, freedom, how much does this cost? “What I miss is being on the pier waiting for the fishing boat and the fishermen to arrive home with their fish. I miss the emotions of going to a market to get inspired with ingredients that make me dream. I miss walking in the countryside with those who go foraging for herbs. I miss going to say hello to the wild pigs in the woods, I miss the burned fingers or cuts, I miss the heat of the pot on the stove. I miss the adrenaline of a crazy night. I miss the rosemary’s perfume which first hugs the pigeon, then me and then the kitchen. I miss arriving home in pieces because I am so tired but proud of the day. Maybe I am mad but I will read a phrase from Jacques Brel who says. “It took talent to get old and not become an adult,” Pierangelini concluded to a huge round of applause. If you have 30 minutes to spare, I would urge you to watch this video of his speech.